ActiveCampaign provides default fields for storing information about your contacts. You can also use custom contact fields to collect additional information important to your business. All custom contact fields created will appear on the Manage Fields page, contact profile pages, CSV import page, the segment builder, and the form builder (inline forms only). You can create an unlimited number of custom contact fields and organize them by group. Custom contact fields can be created from the Manage Fields page, any contact profile page, any inline form, and the Import Contacts page. 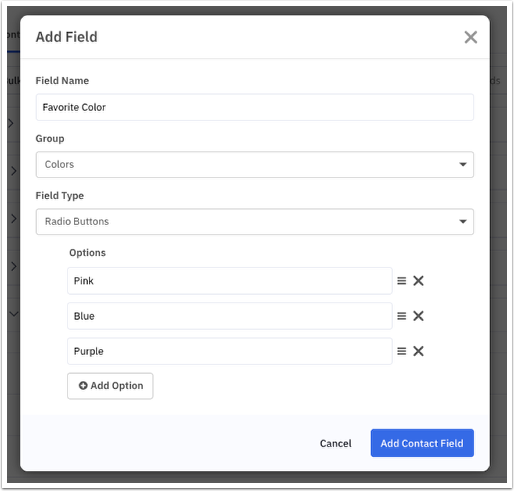 In this section, we'll show you how to create a field group and how to create a custom contact field. Field groups are created on the Manage Fields page in your account. You can use this feature to group similar custom contact fields together, making it easy to find relevant information as well as give you a clean view of the Manage Fields page and all contact profile pages. Select which group a custom contact field should belong to when creating a field from the Manage Fields page or a contact profile page. Drag and drop a custom contact field from one group to another. 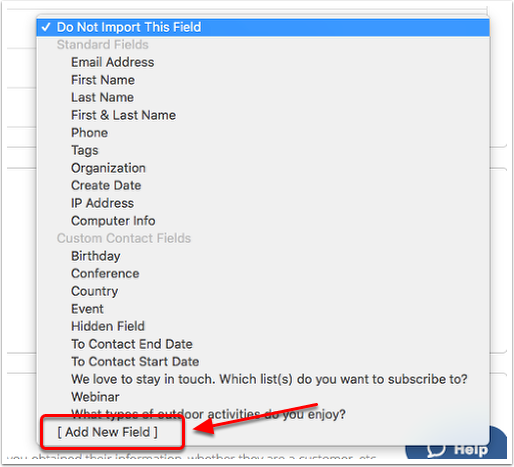 Use the Bulk Actions dropdown on the Manage Fields page to delete a selection of custom contact fields, create a new Field Group from selected fields, or move the selected fields to a different Field Group. Custom fields created from forms, CSV imports, and integrations will be added to the General Details field group by default. You can move these fields to a different group by using the Bulk Actions dropdown on the Manage Fields page. You can also drag and drop the field to a different group. Standard system fields, such as First Name, Last Name, Email, and Phone, cannot be moved from the General Details field group. Click either "Forms" or "Lists" located in the left menu. Click the "Contacts" tab on the Manage Fields page. A modal window will appear. Type the name of the group into the field provided. The group will be listed on the Manage Fields page and all contact profile pages. You can change the name of the field group at any time from the Manage Fields page. To do so, hover your mouse over the field group name and click the pencil icon. To delete a group, hover your mouse over the group you wish to remove and click the trash icon. A prompt will appear and ask you to move any fields to a different group. Once you select a group to move existing fields to, click "Delete." Click either “Forms” or “Lists” located in the left menu. Click the “Add Field” button in the top-right corner. Type the field name in the field provided. Select which group the field should be added to by clicking the "Group" dropdown. Click the "Field Type" dropdown and select the type of field you wish to create. You can also add answer options for check box(es), dropdown, list box, and radio button field types. Click the "Add Contact Field" button. The new custom contact field will appear on both the Manage Fields page and contact profile pages under the field group you selected. In addition, the field will be available on the CSV import page, the segment builder, and the form builder (inline forms only). From the Contact Overview page, click on any contact's name. Click the "Add Field" button. An "Add Field" modal will display. Type the name of the field into the field provided. Click the "Group" dropdown to select the group that the field should appear under. From the Forms overview page, click "Edit" for the form you would like to create a new custom field for. Click the "Add Custom Field" button located under the "My Fields" tab. Select the type of field you would like to create and click "Next." 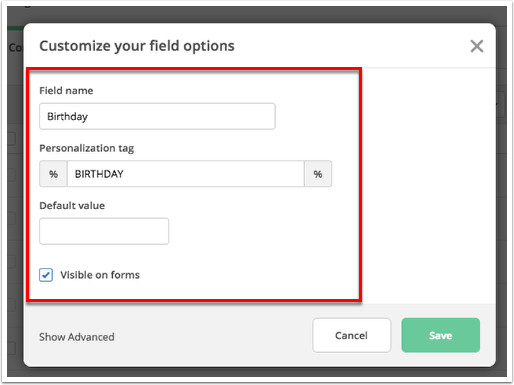 Customize the field option by providing a name and option values (if applicable). Any new custom contact field you create from the form builder will be added to the General Details field group by default. To change the group for this field, navigate to the Manage Fields page and drag it to a different group. The new custom contact field will appear on the Manage Fields page, contact profile pages, CSV import page, the segment builder, and the form builder (inline forms only). When you import contacts from a CSV file, you can create new custom contact fields right from the import page. From the Contacts Overview page, click the "Import" button. Click the "Import from File" button. When mapping CSV columns with fields, you can create a new field by clicking the "Map into field" dropdown > "[Add New Field]." Any new custom contact field you create from the CSV file import page will be added to the General Details field group by default. To change the group for this field, navigate to the Manage Fields page and drag it to a different group. The new custom contact field will appear on the Manage Fields page, contact profile pages, CSV import page (for future imports), the segment builder, and the form builder (inline forms only). This is a traditional text input field that collects a short piece of data that a contact would type. You can use this to collect short, typed responses from contacts when they submit a form, for example, a name or phone number. This field type offers allows contacts to type multiple lines of text, allowing you to collect more data. You can use this to collect longer typed responses from contacts when they submit a form, for example, multi-sentence answers to a question on a form, notes, etc. This is used to specify a date and includes month, day, and year and can be used to collect birth dates, anniversaries, events, and more. The date field in a form uses the following format: YYYY-MM-DD. Upon form submission, the date will convert to the date format you have created in your account. If you do not wish to use this date display format, you must use a text input field to collect date information instead. In addition, if importing a CSV file, date fields should also use a YYYY-MM-DD format. This uses a predefined set of options that contacts can select when submitting a form. This field type is recommended if you have ten or more options for contacts to choose from. If you have less than ten options, use a Radio button field instead. This field type displays a list of predefined options that contacts can choose from. Contacts will need to shift-click to choose more than one answer option for this field. This custom field type functions the same as the drop-down menu field type; contacts can only choose one answer from a list of predefined answers. However, the visual representation is different. This custom field type allows contacts to choose one or more answer options from a predefined list of options. This custom field type is a text field and is not visible to contacts. You can use this to assign pieces of information to contacts when they submit a form. Read more about hidden fields here. You can edit any custom contact field you create. 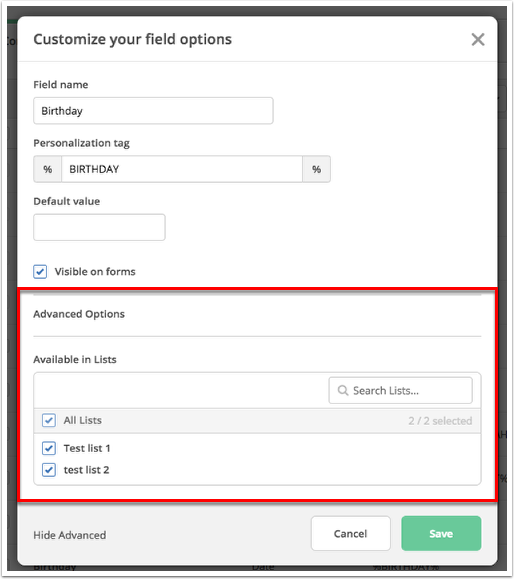 To do so, go to to the Manage Fields page in your account and click “Edit” next to any custom contact field to display additional configuration options. This is the name of the field you created. Once updated, the change will be reflected on the Manage Fields page, contact profile pages, any automations that refer to this field, and the segment builder. The field name will not be updated on any forms that refer to this field. This applies to dropdown, radio button, check box, or multi select field types only. Here you can edit the value options you've already created, add new value options, remove a value option, or change the order in which the value options appear. Some of your contacts may not have a value for a field you create, and will appear as blank. With the default value, you can select which value should show in that custom field for your contact instead of no value. Read more about default values. Clicking the "Visible on forms" box will let you use this field on inline forms. By default, this box is checked for all fields. To assign a custom field to a specific list(s), click the "Show Advanced" option. By default, all fields are set to "All Lists." This means that the custom field will be listed on all contact profile pages, regardless of which list the contact is associated with. See this help article to learn how to delete a custom contact field. We generate personalization tags for every custom contact field you create. You can use personalization tags to dynamically insert a field's value into your communications. Then click the personalization tag you would like to insert into your email. Learn more about using personalization tags in your campaigns, subject lines, and preheader text. Trigger an automation to run based on a date-based field or when the value of a field changes. All custom contact fields you create will be available in the segment builder. You can use this condition to create list segments for email campaigns, “If/Else” forks in automations, set up “Split test” automations, update a deal or contact score, create Goal actions in automations, and more. Use custom fields to collect additional information from contacts when they submit a form. Increase engagement with your campaigns and automation emails with personalization tags. When a personalization tag is used in a campaign or automation email, the value of that tag will automatically be inserted once the communication is sent to a contact. When the contact opens the communication, they will see the value for that tag and not the tag itself. How do I add a hidden field to my form?